Do you want the look of vintage steel kitchen cabinets — but don’t want the hassle of searching out, and possibly needing to restore, vintage? 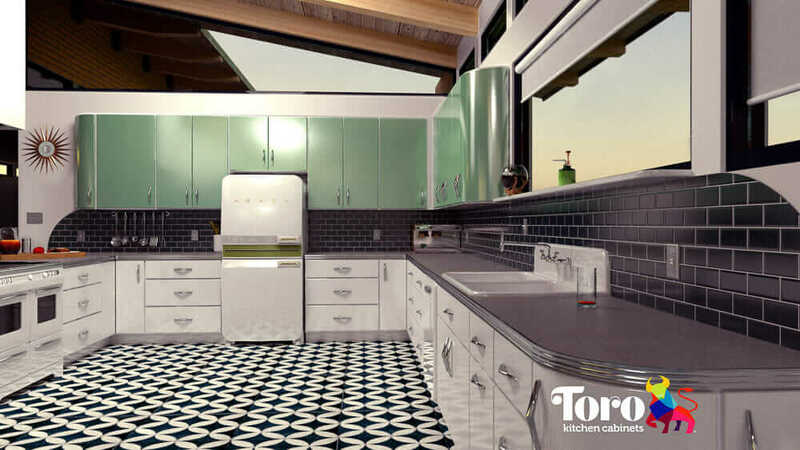 If so: Here’s a new source for new wood cabinets faced with that oh-so-retro powder-coated steel door: Toro Kitchen Cabinets. I am super excited to send you this email. 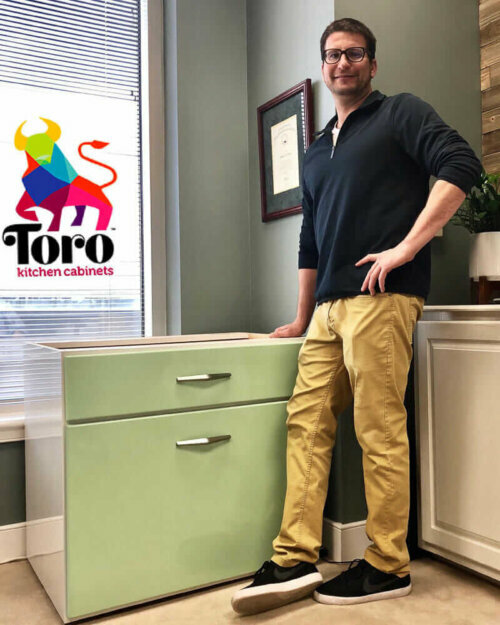 I’ve been visiting your site because I am the cofounder of a company called Toro Kitchen Cabinets. The creative and industrial designer of our cabinet line, Avi Gordon, is a ’96 architecture graduate from the University of Arkansas and a Miami and Southern California surfer who has created a line of cabinets that are right up your alley. A fresh mix of modern and retro-inspired design is the basis for the lineup. An all-wood box construction and a metal door blend the old and new bringing a mid-century modern appeal. The line is a semi-custom line that is made in the USA. The door is powder-coated to any color the customer chooses, there is a choice between several handle styles, as well as legs or a standard toe-kick and the box comes in either a light wood, walnut, ash (gray stain) or white melamine. These customizations offer a style that can fit into anyone’s home and look stunning. I followed up, and Heather sent photos and more information. Avi Gordon — aka Heather’s husband — is a trained architect who, while shaping surfboards — his hobby — contemplated using those same skills to make a consumer durable product. The path to this product — in this style — had a few other influences. Avi grew up in Miami, which gave him an appreciation for Art Deco design. Later, he spent 12 years in mid mod mad Southern California, where as an architectural student he studied Case Study Houses. 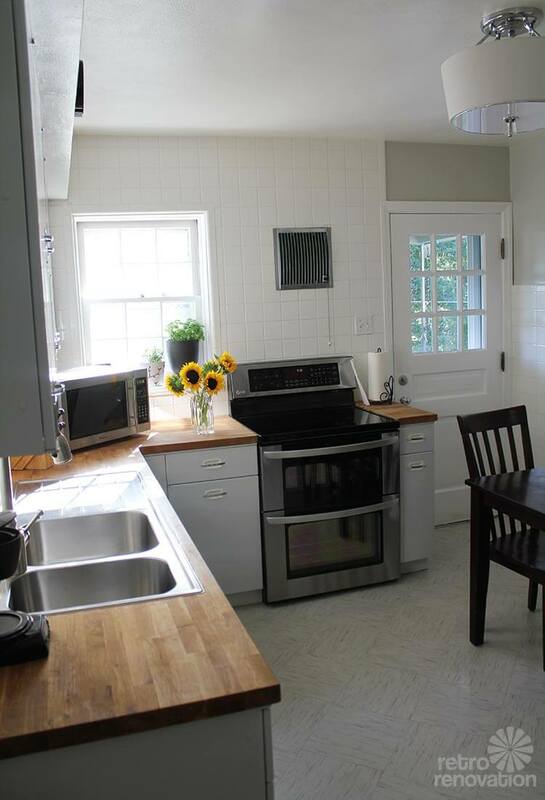 Then, researching sites like Retro Renovation, where they saw the revived interest in vintage steel kitchen cabinets, Avi and Heather saw the potential, more specifically, for replicating that look — and their company was born. The Toros, on the other hand, have wood boxes and not-quite-full overlay steel doors and drawers. 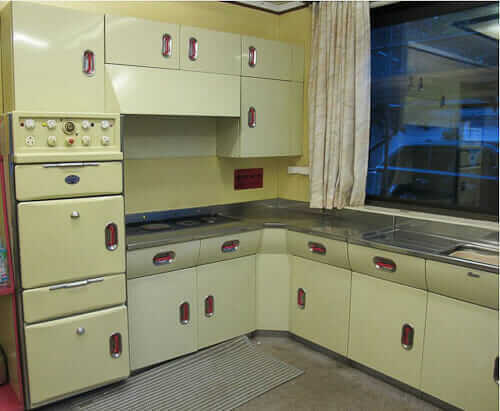 I tend to be a retro-reproduction purist, but that said, the not-quite-full overlay doors and drawers wouldn’t bug me, I think, if the box were painted or laminated the same color. Clearly, though, Heather and Avi appear to be working to extend their design in to the retro-contemporary space by (1) mixing box and drawer colors and (2) showing the cabinets set on legs. This is a much more modern look. Good news: Looks to me like the design is flexible to go either old-skool or new-skool — smart business. In their email to me, Toro makes a case that foregoing the 100% overlay also means that there is less chance that drawers and doors might get off kilter and scrape and scratch against each other. I have not had this problem with my vintage Genevas, which seem to have exacting tolerances. But it could be that lesser vintage cabinet designs (GEs come to mind) could have this issue. The door and drawer heads are the main feature and are composed of 18 gauge cold-rolled steel with a powder coated color. A brushed aluminum back brings a nice finish to interior side of the door and drawer plates. The cabinet is an all wood ¾” plywood box with premium wood veneers in a European frameless construction that allows for the greatest access to the cabinet’s interior. Dovetail all-wood drawer boxes, premium Blummotion soft-close hinges and drawer slides that are rated up to 120 lbs complete the package. All drawers are deeper than standard — perfect for sliding cutlery trays and storing big pots and pans in them. 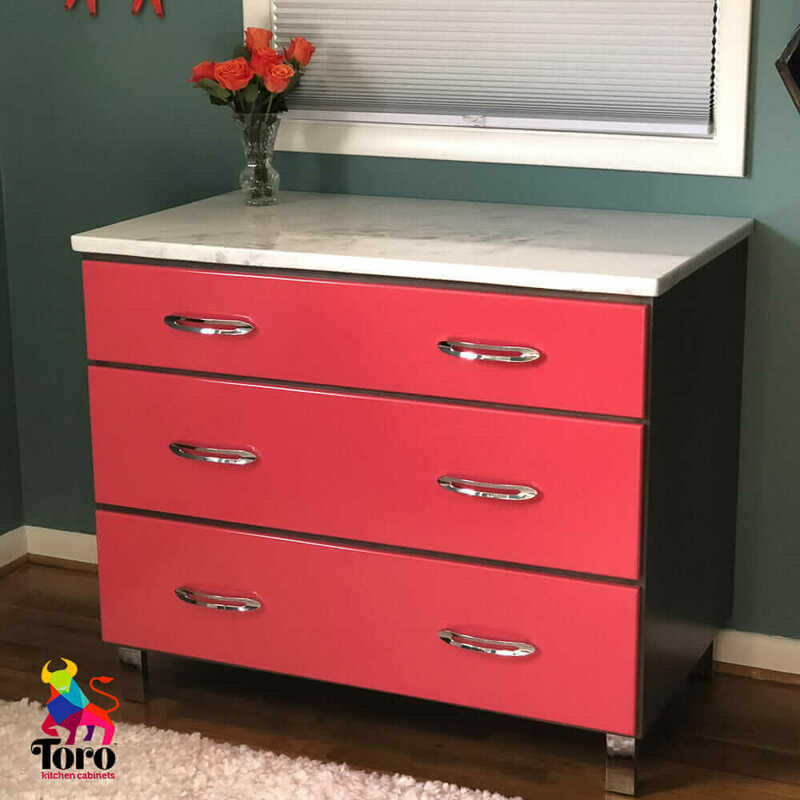 An option for designers: white vertical grade laminate (again on an all-wood box) to make a hybrid modern look with a ½” reveal around all doors and drawers. This allows the paint to pop off the background color of the cabinets. The eye drawing down the horizontal and vertical lines that the door and drawer heads lead one into the idea of purposeful art and function. These cabinets are made, manufactured, and designed in America. Hi Pam, It’s been a long road finding manufacturing for the metal doors and also converting files to the correct engineering format. 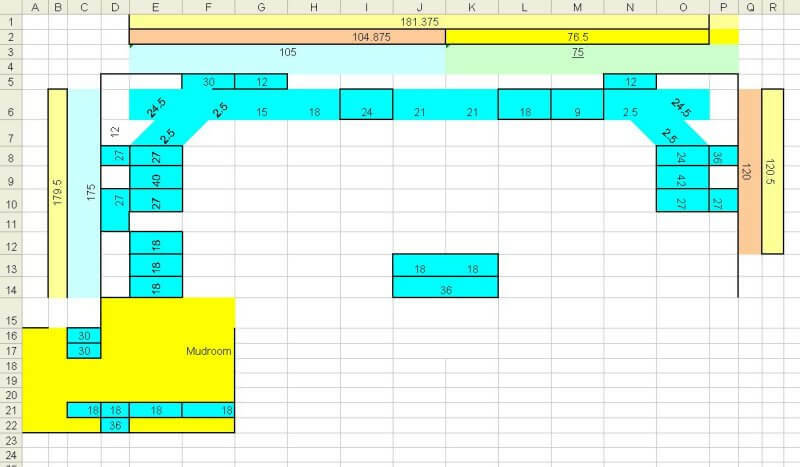 While we could ballpark pricing, it just wouldn’t be accurate for everyone because every kitchen is, of course different. …Our process is to consult with clients, learn what they want and how they use their kitchen, design a kitchen based on the conversation, create a rendering and present to the client. If they approve, we place the order and drop ship to their home. We recommend that our clients use a professional kitchen installer to provide preliminary measurements of the client’s space and install the cabinets after delivery. Good luck, Heather and Avi — it is great see these options available in the marketplace — they look beautiful. 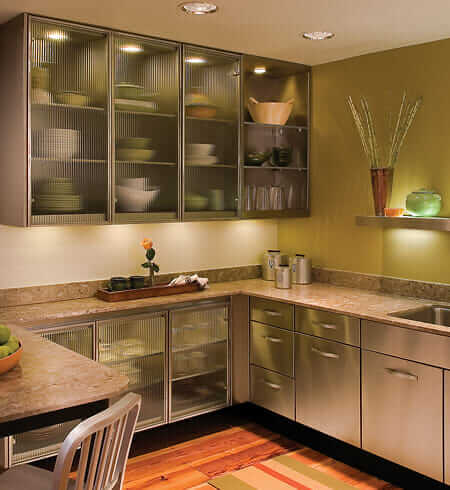 See all my stories about steel kitchen cabinets here. What is the price range for these beauties? OMG! 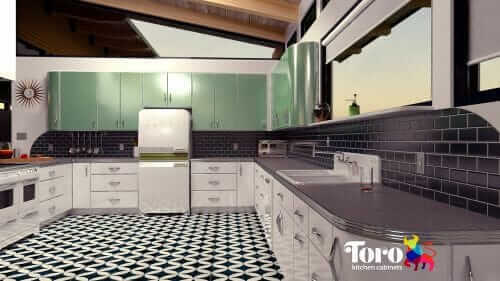 That photo of the kitchen is amazing!!!! If I could just talk my husband into going back in time…. :) LOVE this idea! I’m in the middle of rehabbing a 1940’s multifamily. You guys are such a resource! Thank YOU!!! !